German Lopez at Vox has an interesting article about hate crime legislation that juxtaposed a common argument with the reality on the ground. It’s not just that you dislike people of my background. You’re entirely free to dislike people of my background. It’s not that you tell me that you don’t like me. Again, entirely free to do that. It’s that you selected me for some sort of criminal action because of my background. Targeting someone’s motive makes it very difficult to actually prosecute hate crimes. After all, many criminals are not going to be dumb enough to blurt out their exact motives in the course of committing a crime. For investigators, this is always going to make it difficult to definitively prove that an act is a hate crime. 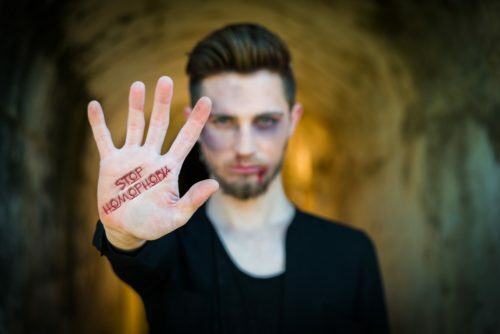 Arguments about hate crimes legislation – both for and against – assume that it’s the perpetrator’s thoughts that make a crime a hate crime, and that actions like slurs are used to determine what the perpetrator’s thoughts are. Instead, it’s more productive to think that the perpetrators actions make a crime a hate crime. Take, for example, this story from last week about someone in a small town in Wisconsin stealing and burning rainbow flags. While violent crimes get more attention in the media, these sorts of low-level crimes make up the bulk of hate crimes, according to Bell. Imagine that instead of stealing and burning rainbow flags, the perpetrator stole and burned a seemingly random assortment of flags: American flags, Wisconsin flags, banners for Girls Scout troops, etc. Also, let’s assume that this person still committed this crime because of anti-LGBTQ attitudes; they hated the United States, Wisconsin, the Girl Scouts, and other entities because they are too supportive of LGBTQ people. If this person is caught and is smart enough to avoid saying why they took and burned the flags, then it would be hard to prosecute them for a hate crime, even though their motive was hatred of LGBTQ people. But perhaps the better question is: was there any hate crime committed here? The reason hate crimes are considered worse than comparable crimes is that they’re an attack on an entire population, meant to make a group of people afraid. Hate crimes legislation is a good way of getting police departments to take seemingly small crimes seriously, since stealing flags is unlikely to make someone fear for their safety while holding hands with their partner in public, but stealing rainbow flags will. The point of committing a hate crime is to express antipathy toward an entire class of people. No matter the intelligence of the perpetrator, if their goal is to beat a gay person up in order to make gay people afraid, shouting epithets is a lot more effective way of doing that than staying quiet. If haters are learning to hide their motives now by spray-painting gibberish on walls instead of slurs, then that’s actually an improvement. I’d rather not see anti-gay slurs in public. So I would go one step further than Bell and say that someone can select a victim because of their background and hate crimes legislation would have nothing to say about that. It’s that a criminal used a crime as a vehicle for attacking an entire class of people by taking concrete actions to make that class feel less safe.